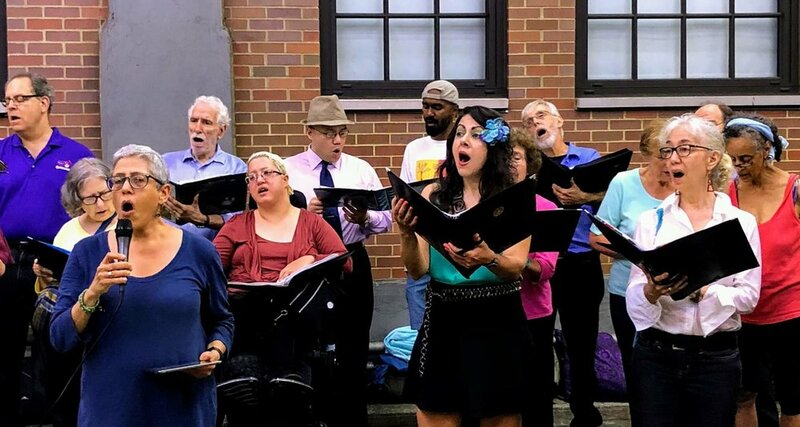 I walked down West 43rd Street and I arrived at a Renaissance-style building and knew I had found the place wherePeace of Heart Choir would be performing an outreach concert later that evening. I walked in and showed my ID and signed in at the front desk. The building reminded me of an old-time gleaming movie palace with its high ceilings, its winding staircase and mezzanine lined with holiday lights and garland and various holiday decorations—its architecture reminiscent of a bygone era. The Times Square Hotel has a rich history. Built by the developer Henry Claman in 1922, it originally catered to single men and then to single women. Throughout the years, this majestic building now on the official National Register of Historic Places in Manhattan, has undergone many incarnations. Today, it is owned by Common Ground as its flagship supportive housing residence whose mission is toprovide affordable housing for the formerly homeless, some of whom live with HIV/AIDS, mental illness, or physical disabilities, and working professionals—many of whom are low-income performing artists including several jazz musicians. In the center of the lobby were two beautiful Christmas trees with a gold statue of a cherub in between the two Christmas trees. There was a piano in front of the statue and a smaller gold statue of a cherub to the left of the first Christmas tree. Chairs were set up for the audience. René was rehearsing the songs we would be performing. We ran through several songs in our repertoire. Some people sat in the audience and watched. Soon enough it was time to start. Gary introduced the choir and its mission to the audience. The audience tricked in as people walked through the lobby and decided to sit down or stop and listen as they had hot cocoa or coffee that was set up on a table in the lobby. Our first song, Pharrell’s chart-topper, “Happy” was a great way to start the outreach. It was infectiously upbeat and hit just the right note with the audience. 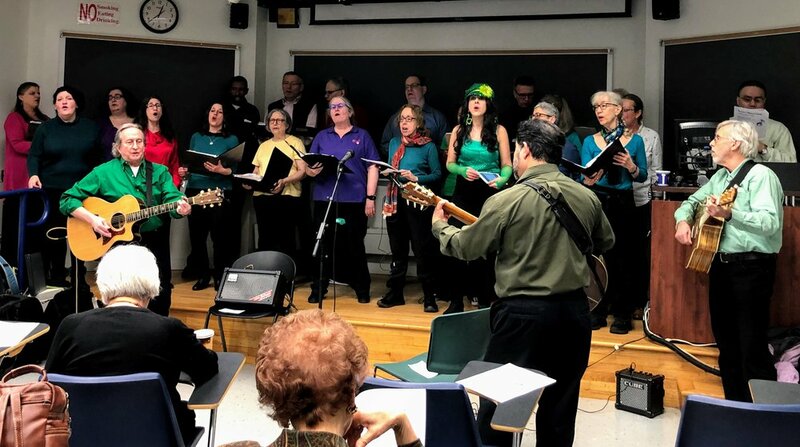 We performed Paul McCartney’s response to racial tensions in the US during the spring of 1968, the classic “Blackbird”, with a lovely solo by Brian. As the outreach progressed, our audience grew. One man stood in the mezzanine showing his obvious appreciation of the music as he swayed his body to the music. We really had him on his feet. We sounded pretty on a trio of love songs we performed: the first one, the Indian love song, “Mahi Ve”, the second, the Spanish love song, “Si La Nieve” introduced by Deb who had proposed it, and finally, the Korean love song, “Arirang” introduced by Sheila. 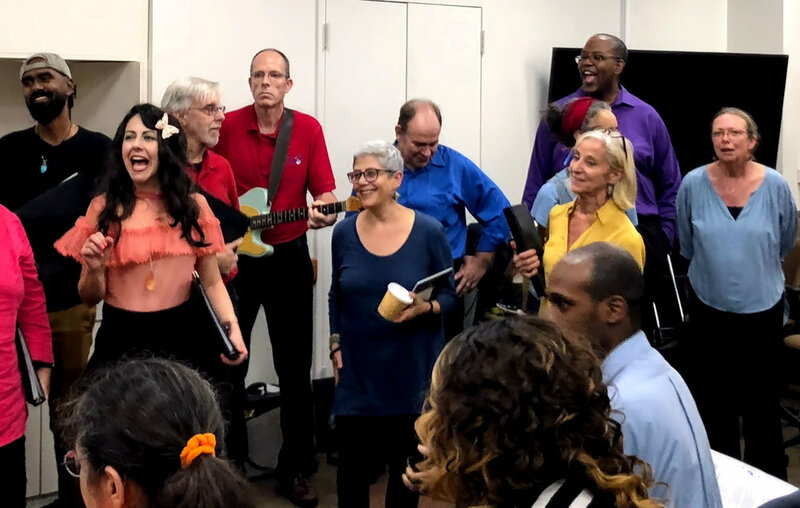 We performed some of our core songs too—the James Taylor standard, “That Lonesome Road” with a beautiful solo by Nancy, our sing-alongs “Peace Like A River”, “Rock-A-My-Soul”, and“Down By the Riverside”. “Peace Like A River” sounded strong and triumphant. We split up our audience into three sections as is customary for“Rock-A-My Soul” and then went into each section to coach the audience their respective parts. This was such a wonderful exercise in audience participation. They really seemed to enjoy singing along! During “Down By The Riverside”, we went out into the audience to shake hands at the part that prompts us to do so. It was a warm-hearted welcome from a mostly male audience. The audience had grown and now most of the 40 or so seats were now filled. Another core song, the Matisyahu anthem for peace, “One Day” sounded beautiful with really lovely solos by Gary and Hikari. As René noted, this song has really become part an important part of most of our outreaches. One audience member definitely agreed. He singled out the song and in particular how much he liked Gary’s voice. We performed three holiday songs: “Deck The Halls”, “Seven Principles”, and “AlHaNissim”. Susie introduced the holiday classic “Deck The Halls” and as she noted, we performed a jazzy rendition of this classic. The man in the mezzanine definitely appreciated our jazzy spin on this traditional song. He swayed to and fro with a smile on his face. The Kwanzaa song “Seven Principles” highlighting each of the principles of each day of the celebration sounded lovely and featured nice vocal support from Gail. The Hebrew celebratory Chanukah song, “Al HaNissim” sounded exuberant and spirited. 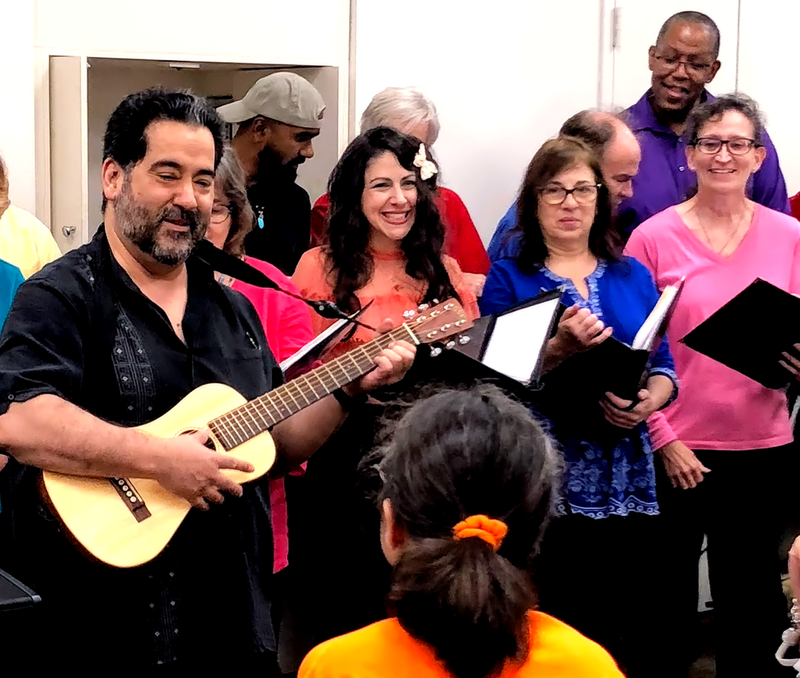 René included one of our crowd favorites, the unofficial anthem of Cuba, “Guantanamera” meaning “woman from Guantanamo” whose better known official lyrics are inspired by the poetry of José Martí. Our voices were lively and joyous and the audience definitely appreciated it. René noted how José Feliciano was performing just down the block at BB King Blues Club and Grill. This inspired René to lead us in an impromptu fun and spirited version of “Feliz Navidad”. Charlie introduced “Let There Be Peace On Earth”. He had proposed the song many years ago when Peace of HeartChoir was first formed, and the song has since become the de facto unofficial anthem of our choir and our signature closing song. We sounded magnificent featuring a sublime solo by Charlie. As René noted, a special thanks to Brian, Ruth, Marv and Gail who added so much to this outreach with their wonderful musical accompaniment. When the concert was over, René directed us to take our bows to the applause of a very appreciative audience. As we dispersed after the concert and said our goodbyes, I looked around and saw the old black-and-white photos that lined the walls celebrating the building’s history. A sign in the back read“Peace of Heart Choir Performance 6:00PM – Lobby * Coffee, Cocoa, and Cookies* “. I looked up at the majestic mezzanine with its sweeping staircase and lovely decorations and thought of the wonderful acoustics of the space where we had just performed. This had been such a lovely place to sing--what a wonderful way to end our outreach season!! Hope everyone is enjoying the holiday season! Wishing everyone a very Happy New Year! Looking forward to seeing everyone in 2016! I walked off the bus and I made my way across the intersection. I could see the Flushing branch of the Queens Public Library from across the way decked out in holiday regalia, a Christmas tree with brightly colored lights with a menorah by its side. The scene stood out in downtown Flushing amidst the endless shops and bus stops and hustle and bustle of this neighborhood—a brief bit of serenity to counteract the hubbub this holiday season. I advanced towards the sparkling lights and found Alex waiting on the steps. I walked in and Gary was there to welcome us and direct us to where we would be warming up. Alex and I joined the other choir members. We put our belongings in what was essentially a dressing room complete with lighted mirrors.We warmed up a bit. It was a beautiful concert hall. It was most definitely a community concert—families and children filled the seats--around 90 people were in the audience. The lights drowned out most faces beyond the first row. We could clearly see the family sitting in the front row. The mother and father told their daughter to be quiet throughout the performance. She was playful, adorable, dressed in hot pink from head to toe from her top to her winter boots. She put a smile on all of our faces. We began with our signature opening number, a rousing Siyahamba. Next was a melodic Wanemo with lovely solos by Gail and Lily. We followed it up with a different turn, the fun, Ukrainian holiday song, Carol of the Bells. Next we did a breakneck Geantri. Marv provided spirited musical accompaniment on guitar to Michael Row the Boat Ashore. The concert continued with the James Taylor standard, That Lonesome Road, with fine vocals by Gary. The Carole King classic You’ve Got A Friend had lovely vocal support from Gail and Wilfred and pretty musical accompaniment by Evelyn on violin. Our Maori love ballad, Pokarekare Ana, was next and our sound benefited from the fine musical accompaniment by Marv on guitar and Rene on ukelele. And so, we took our bows as instructed by Rene to enthusiastic applause. Right after the concert, we spoke with Gina, the events coordinator. She thanked us for coming and noted not only the nice size of the audience—around 90—but also the positive reaction. She was very pleased. As we walked out into the lobby, we saw the same couple from the front row with their adorable little girl—a vision of hot pink exuberance and still as playful and active as during the performance. Her parents began to apologize for her. Then Gary smiled and indicated that was nothing he hadn’t seen from his own children in their time or in any little ones of a certain age for that matter. The couple thanked us and told us they had enjoyed the concert. Funny how everything always comes full circle. The concert over, we all headed out into the crisp night air—some of us taking a fun-filled ride with fellow choir members back to Manhattan and various other points and another small group of us including me taking advantage of the fine Asian cuisine in this Queens enclave, sharing a Vietnamese meal together. It had been a lovely outreach--our only one in Queens this season. I looked for the red double doors noted in the Peace of Heart Choir email with details for our outreach at Advent Lutheran Church and when I spotted the red doors I knew I had found the right place. I walked through the red double doors on the side of the building and walked down the stairs to the basement past a long line of those in need waiting to be admitted for their monthly luncheon—in this case, a Thanksgiving meal. When I arrived downstairs, I found preparations underway—volunteers scurrying to get everything ready. There was a room in the back with countless pieces of pumpkin pie. I was very early and so was a small contingent of Peace of Heart Choir singers who were in the middle of it all chatting with Rene. Volunteers cleaned tables and we began to do our vocal warm-up. Our performance area was definitely going to be a tight fit but we adapt easily. There were rows and rows of tables with at least 75 people in attendance. Perhaps that is a low estimate. There easily could have been over a hundred. Sightlines were tricky because there were several poles in the way so not everyone in attendance had an unobstructed view. Nonetheless, as our audience began their meals and volunteers came around serving food, we opened our outreach with our signature opening piece, Siyahamba. We continued with the lovely sounds of Wanemo with fine vocal support from Gail and Cheryl. The Maori love ballad Pocarekare Ana was next followed by Barry’s impromptu heartfelt version of It Had To Be Youto which several audience members sang along. Next was the sing-along Down By The Riverside with fine musical accompaniment by Dave on guitar. One minor difference though we did not go into the audience to shake hands as usual. It was clear we did have a cheering section in the lady in the red sweater with a white scarf wrapped around her head. As Lexi declared, “This lady was great!” I know she definitely put a smile on my face and moved me with her enthusiasm. I can’t agree with Rob more wholeheartedly in his assessment that she embodies what the spirit of outreach is all about. She was most visibly affected by Carole King's You’ve Got A Friend with lovely vocal support from Laura and Wilfred. She sang along, mouthing the words and even began to cry. James Taylor's Lonesome Road was next with another fine vocal turn from Wilfred. Rene looked out to us and at this point signaled we had done enough, yes? And so all was left but one of our core songs, Let There Be Peace on Earth which was introduced by Ruth and was a lovely way to end the afternoon. The 9/11 Memorial is a contemplative, park-like outdoor space with lawns, walkways, and rows of trees surrounded by ivy groundcover. POHC was honored to be one of four groups performing there on 9/12. The bagpipes were the first group, while it was still light; when they finished, they graciously posed for pictures with choir members. Next came a string chamber group whose sound was all but lost in the great outdoors until Rene, Brian, and Dave assisted them with POHC amplification equipment brought by Rene. Third was a singer who has sung the “Star Spangled Banner” in all fifty states. When she finished singing it here, she invited her “friend who I just met,” Evelyn, a POHC soprano, up to the podium to read a poem she (the Star Spangled Banner singer) wrote about love of country and flag. All this took some time, and when the POHC ascended the podium, the light was fast fading. There was still a sizable audience on the grass, though. How many were POHC family and friends, and how many random passers-by, I do not know. We sang ten songs, all well-received. What was more challenging than getting our sound to carry in the open space was the light. From the time we sang our first song, “Senzenia,” to the time we sang our last, “Let There be Peace on Earth,” our sheet music went from visible to invisible. For some songs, that was no problem—most of us knew them by heart. Others, like “Hard Times” and “Cherokee Morning Song,” were not as easy. It was also difficult for Rene to see the pitches on his pitch pipe. Despite all this, we sounded wonderful. I think we all felt very good about our performance—not just for the way we sang, but for our participation in the commemoration. Last night we performed with the Classical Fusion Chamber Ensemble (CFCE) in the beautiful Shrine Church of St. Anthony of Padua. The concert was in remembrance of 9/11. This was the first time, to my knowledge, that POHC sang with a full orchestra and was directed by an outside conductor. It was an interesting experience. There were sixteen pieces on the program. Seven were performed by orchestra alone, six by POHC alone, and three by the combined orchestra and choir. Of the three pieces we did together, Rene conducted two: “Star Spangled Banner” and “Non Nobis Domine.” The third, "Hope," was conducted by Stephen from CFCE. Those three were the most challenging to prepare. We had two rehearsals. The first was in a studio barely large enough to contain the whole orchestra. The choir members stood in the back, squeezed against one another. Think rush hour in a subway car without air conditioning. The second was in the church, much more humane and roomy. During the rehearsals, we worked out the sound balance—the choir had to sing very loud in order not to be drowned out by the orchestra. And for “Hope,” we adapted to a different conducting style, a new way of getting cued in after many measures’ rest. POHC is nothing if not flexible and professional. The highlight from CFCE for me was “A Call To Courage,” from the 2006 motion picture Ladder 49, about a firefighter. It was moving and exquisitely performed. I also loved watching their drummer, a boy so young he was probably born after 9/11. While I enjoyed singing in this concert, I didn’t feel as much of a connection to the audience as I do in our smaller community concerts, where we get closer to the audience and sometimes walk among them. This was more formal, with the orchestra in the pit and the choir on the stage. Still, it was a thrilling experience. It was also nice to see many POHC members and spouses/partners in the audience. Well-done, choir. And now we can look ahead to our regular seasion, with our regular conductor, the incomparable Rene.